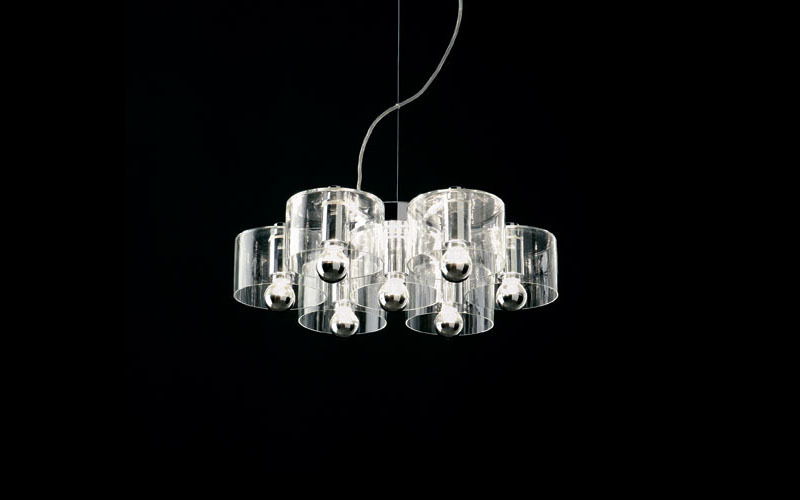 Oluce Fiore Italian Glass Chandelier by Laudani and Romanelli. An intentional reminiscence of the 1970s is what characterises Fiore. The lamp becomes a flower, a typical flower with a central core and petals in a radial pattern. It may be a daisy, barely outlined in the abstract sharpness of the metal and glass, but poetically evoked by the shadow that is projected on walls and ceiling. A flower, in the contemporary confusion of flowers, not created by the decor, but actually made by the structure. A flower that is a symbol and a metaphor: "bring some flowers of light in your home!" Each diffuser measures 5" x 5". Cable lenght is 7'. Material: transparent blown glass and chromium plated steel. Light Source Small: 7 x max 25W E12 (light bulbs will be included). Light Source Large: 13 x max 25W E12 (light bulbs will be included).